The human body is alkaline in nature. The foods that we eat can change the natural ph balance of the body. Some foods leave acidic by products in the body. On the other hand, there are numerous foods that leave alkaline by products in the body.The ph level does not indicate the ph level of the stomach alone. It is the ph level of the entire body including many body fluids and tissues. The ph level is measured on the scale of 0-14. A ph level of 7 is thereby neutral. Lower ph levels are acidic, while higher ones are more alkaline.A ph factor of 7.3 is ideal for the body, which is 4 parts alkaline and 1 part acid. The ph level can be found out by conducting tests that assess body fluids like urine and saliva. An acidic ph level can weaken the mind as well as body. 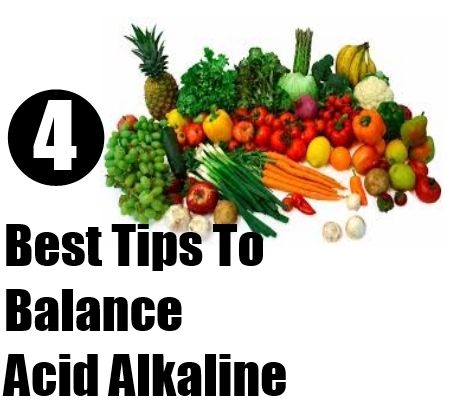 Hence, taking care of the acid alkaline balance in your diet is very essential.There are many harmful consequences of an acidic ph in the body. Firstly, an acidic condition causes the body to use up minerals from vital organs and bones. The essential minerals like; calcium, sodium, potassium and magnesium, are utilized to neutralize the acids in the body. Acidic condition can cause yeast, bacterial and fungal infections in the body. Yeats, fungus, mold, bacteria, and virus can reside inside the body and take in essential nutrients. Such organisms can thrive only in an acidic base, so eating alkaline foods to counter them is vital.It can lead to weight gain, obesity, weak immune health, joint pains, muscular aches, low energy level, chronic fatigue, weak digestion, premature aging, etc. Acidic foods can also cause production of excess mucous, nasal congestion and frequent colds. Headaches can also occur. In addition, one can suffer from anxiety, nervousness and irritability. It also damages free radicals in the body. Acidic foods can also lead to other grave diseases. Some of them are; diabetes, kidney stones, coronary diseases, hormonal problems, etc. It can also cause ovarian cysts, polycystic ovaries, and benign breast cysts.Bladder and kidney problems are also common. Furthermore, it can lead to bone loss. In fact, a habit of eating acidic foods can cause osteoporosis. This condition is very harmful as it can go undetected for years.There are many acidic foods that we could be consuming every day. 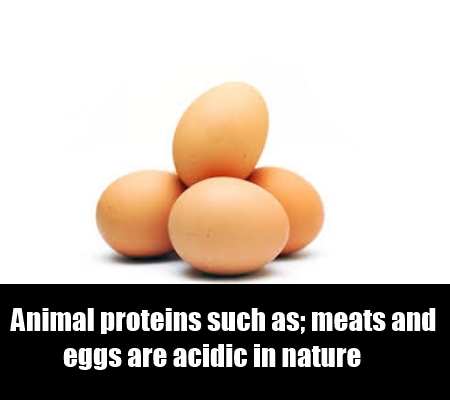 All animal proteins such as; meats, eggs, seafood are acidic in nature. Coffee, tea, soda, and alcohol are also acidic. Most bread spreads, margarines and shortenings are acidic. Be wary of baked goods containing yeast or gluten like; rye bread, rolls, muffins, crackers, etc. A number of processed or artificial foods are also acidic in nature; especially processed meat and sweets. Processed, packaged and smoked meats are very acidic.White flour, white sugar, and sugary malted cereals are also acidic foods. In addition, watch out for your sodium consumption. 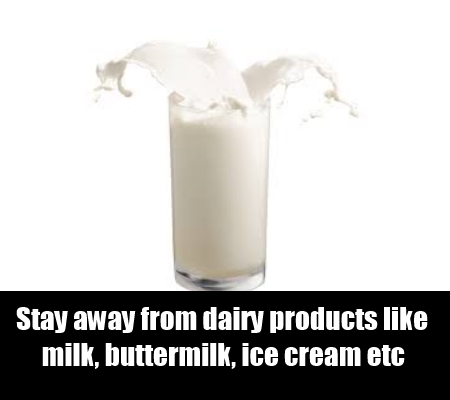 Stay away from dairy products like milk, buttermilk, ice cream, sour cream, whipped cream, etc.Vegetarian foods that can cause acidity are; legumes, grains, beans, peas, etc. Very few vegetables are acidic in nature; some of them are tomatoes, tomato paste, unpeeled carrots, asparagus, brussel sprouts, and cooked beets. Likewise some acidic fruits are prunes, cranberries and plums. One should include more alkaline foods in their diet. Most of the fruits and vegetables are alkaline foods. 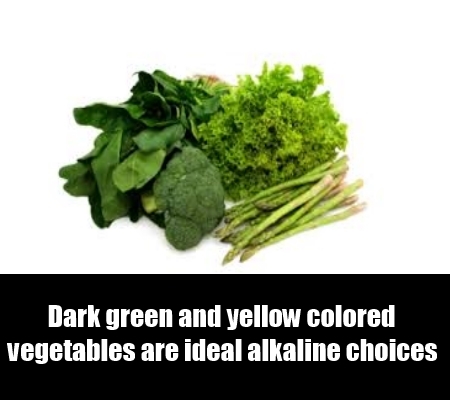 Dark green and yellow colored vegetables are ideal alkaline choices. Also, whole foods are alkaline in nature. Nuts, seeds and a few spices are also alkaline.Sprouted grains and nuts are great options. Any type of mushrooms is great choice of alkaline foods. Essential fatty acids are alkaline in nature. Most of the cold pressed oils are also alkaline. Fresh homemade butter, yogurt, raw cottage cheese, clarified butter and full fat milk are also alkaline.If you liked baked goods, go for yeast free ones. A few examples are; corn chips, popcorn, tortillas, rice cakes, etc. Cereals like rice bran, oat bran, and puffed rice are alkaline. Wheat, rye, barley, bulgar, oats and white rice are good choices. Most of the lentils can be categorized as alkaline foods. Wheat pasta is alkaline in nature. Some alkaline beverages are; water, lemon juice, vegetable juice, ginger tea and green tea. It is a good idea to include neutral foods in the diet. These are corn, soybeans, brown rice, almonds, honey, tofu and lima beans.It is important to assess the internal ph level in the body. Everyone has different ph level, depending on the type of foods they consume. If the internal ph level is acidic, it is advised to increase consumption of alkaline foods.The body will develop several symptoms if the internal ph level is acidic. Some of the common symptoms are; weight gain, acid reflux, heartburn, fatigue, urinary tract problems, receding gums, skin problems, kidney stones and bone loss. Other symptoms are muscle weakness, loss of muscle, aching muscles as well as joints. Poor digestion, intestinal cramps, and irritable bowel syndrome are very important signs of acidic ph level. If you have any three of these symptoms then your internal ph is acidic.In such cases it is advised to include mostly alkaline foods in the diet. At least 80% of the foods consumed should be alkaline in nature. If you are not suffering from most of these symptoms, you can go ahead and include more acidic foods in your diet.However, your diet should not contain more than 55% acidic foods. You should also eat more alkaline foods during summer and spring. In these seasons, ensure that alkaline foods constitute about 80% of your daily diet. You can increase intake of acidic foods in the winter season. They can make up for about 35-30% of your diet.Apart from eating alkaline foods, there are many other ways to remedy an acidic condition. Include food enzymes in your diet or you can take enzyme supplements with meals. Magnesium that can easily be absorbed in the body should be taken with meals.Many alkaline mineral supplements are available readily. Also, liquid chlorophyll is a great option. 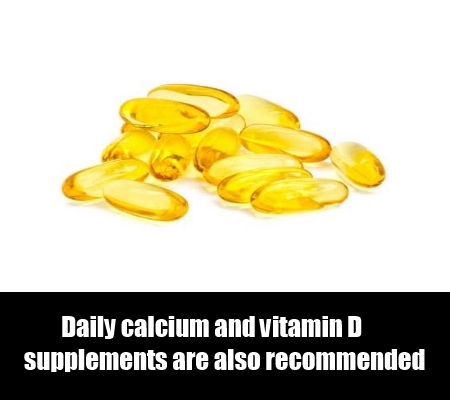 Daily calcium and vitamin D supplements are also recommended. Take psyllium husk supplements for regular bowel movements.